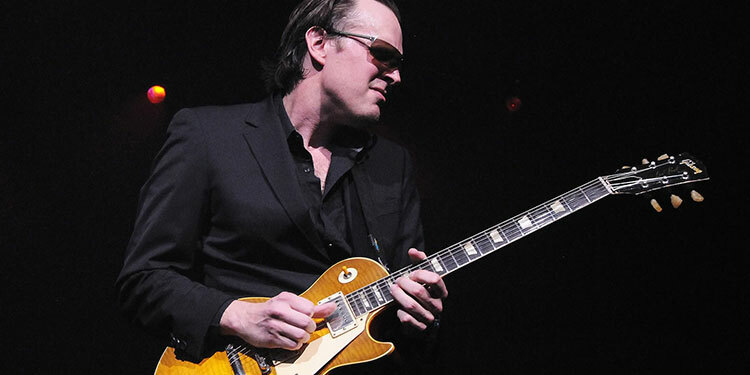 Mark's Tickets is the best place to find tickets for Joe Bonamassa fans. Just check this page for any new events or schedule updates throughout the year. We sell tickets to every Joe Bonamassa concert around the world. We know how passionate Joe Bonamassa fans can be about jazz & blues music, so we make sure to have hundreds of tickets for every concert available right up until showtime. For those looking for cheap Joe Bonamassa tickets, we offer tickets starting at very low prices (many times below face value). We offer tickets in most sections of every venue that Joe Bonamassa performs. Simply choose the city or venue that you are interested in below, and you will be able to see all of the available seats. Do not forget that Marks Tickets also specializes in sold out Joe Bonamassa tickets. No longer will sold out shows prevent you from seeing Joe Bonamassa. Joe Bonamassa (born May 8, 1977) is an American blues rock guitarist and singer. He began his career playing guitar in the band Bloodline, which also featured the offspring of Miles Davis, Robby Krieger of The Doors, and Berry Oakley of The Allman Brothers Band. He released his first solo album A New Day Yesterday in 2000, and has since released ten more solo studio albums, five live albums and four live DVDs, along with three albums with the band Black Country Communion, one with funk super-group Rock Candy Funk Party and two albums in collaboration with vocalist Beth Hart. He tours the world regularly, and has developed a large following in the U.S. and U.K. specifically. His most recent album, Driving Towards The Daylight, reached #2 on the U.K. Top 40 Albums Chart, and he completed an arena tour there in 2012. In 2009 he was the recipient of the Classic Rock Magazine "Breakthrough Artist of the Year" award, and The Guardian said of him: "the 35-year-old from upstate New York has consolidated a reputation as the pre-eminent blues-rock guitarist of his generation". Bonamassa has collaborated with numerous artists, including B.B. King, Eric Clapton, Blondie Chaplin, Beth Hart, Paul Rodgers, Leslie West, Jon Lord, Vince Gill, Sandi Thom and Glenn Hughes. He also played with Hughes in Black Country Communion, along with Jason Bonham and Derek Sherinian. Joe Bonamassa's music contains a mix of several different genres: although it is primarily blues rock, since relocating to Santorini, Greece in 2009 to record the album Black Rock (named after the studios in which it was created), his music has gained eastern influences, with the addition of instruments such as the bouzouki and clarinet (for instance, on "Black Lung Heartache" from Dust Bowl and "Athens to Athens" from Black Rock). He has also covered songs by John Hiatt and Leonard Cohen.